The Hand has discovered the new Power Man’s secret identity! And for violating their edicts, he, his friends, and his family will now be dragged to Shadowland and put to the knife…unless Luke Cage and Iron Fist can save him in time! But does the new Power Man even want to be saved? The new Powerman is having a dream about his ancestors and the God of the crossroads, symbolizing his life and the impending choice that he will have to make. 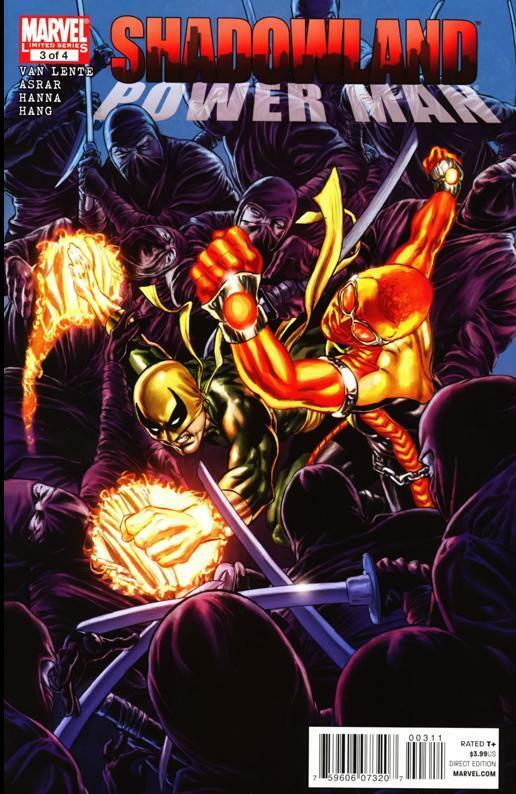 Iron Fist meanwhile is at his dojo combing his records for a potential tie between his school and the new Power Man. He laments how Luke was of no real help; he just went into shutdown mode after their run in with the boy. He sees a picture of the only student he’s had to master the technique Powerman uses and in that instant he realizes his identity. 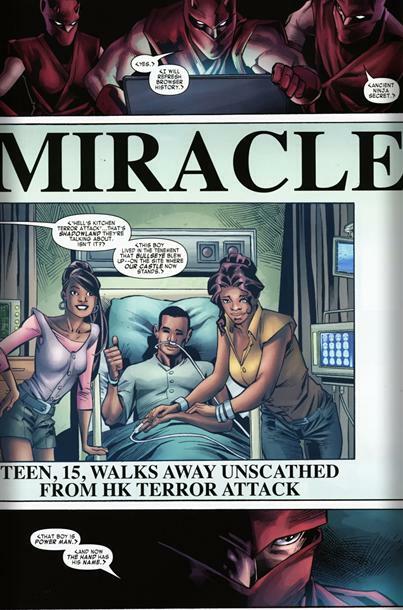 He takes off leaving his laptop for the Hand who also need to track down Power man. They get the info they need and also take off. At a pub crooked cops meet up after one flees the shadowland complex they all serve under Nightshade. Cottonmouth also makes reappearance with new lethal teeth. Power man gets an email tip off about the cops and some stolen goods he tries to take off but his mom stops him. They get into an argument where she reveals that his dad had an affair and that’s why she had left him. Upset and emotional he leaves; his mom checks his computer to find out what may have set him off. Iron fist arrives and tells her he must speak with her son. The chick in the house overhears them talking. At the Pub Power man gets beat up because he can’t power up. Nightshade and Cotton mouth reveal that his dad had used Nightshades tech but never cleared the tab before turning his back on crime. She then reveals that the tech goggles she had given his dad had entered his body as shrapnel and that’s what gave him his powers. Realizing she can’t get it back she offers him a job. Riots in the streets as Power man’s cousin tries to warn him that his mom ratted him out to iron fist. The hand ninja grab her to lure Power man to shadowland and a trap. She tells him to kill the newly arrived Iron Fist who tells him his powers are mystical and not technological as she has said. He explains to Power man that during the explosion he absorbed the life essence of everyone in the building including his student and that’s how he knew his technique. 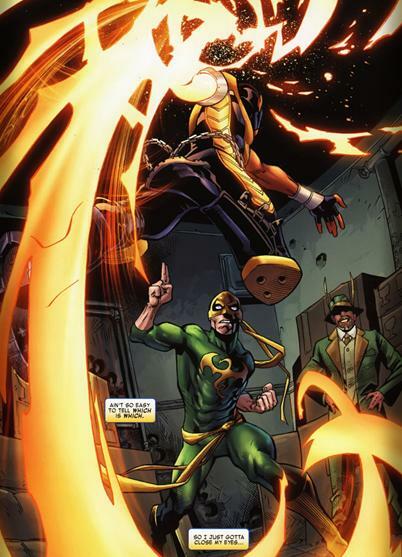 Nightshade reactivates his powers, not knowing what to do Power man closes his eyes and attacks. The story’s pacing has been done well, we get the back-story of his father, his death, the conflict between mother and son, a slew of villains of old such as Nightshade and Cottonmouth (whew, its all here!) New PM also gets tied into existing iron fist mythology setting things up for the already announced Iron Fist/Power man series. The Hand gets closer to killing their quarry now that they have his identity and those of his family. The mystery of the nature of New PM’s powers is also something to look forward to, is it technological or Magical? Or a mixture of both?! What plans does Nightshade have for PM? I also enjoyed the touch on his mixed ancestry and the tie with the god of the crossroads. This character has so much potential it’s not even funny! Nightshade as a villain along with a slew of other unknowns is never the best way to grab sales. The ill description of PM’s powers at this point will leave some displeased. The lack of action is also a problem at this point.